Due to climatic conditions, solar cookers are not always applicable. 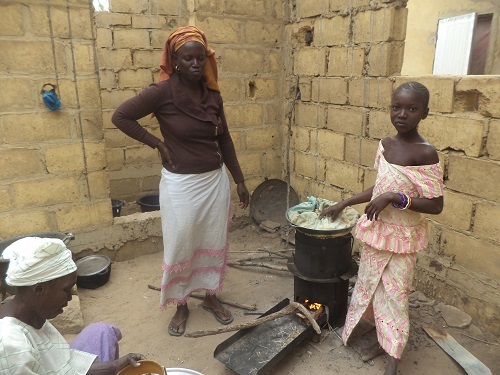 As a supplement and alternative to the SK4 solar cooker, the wood saving stove WSS 2012 was developed. The Wood Saving Stove by EG-Solar e.V. is powerful, energy-efficient and safe. The combustion is complete, almost without smoke. Compared to the three-stone fire, it consumes over 70% less firewood. The safety in handling has to be ensured. The WSS was developed together with pupils from the vocational schools Altötting. 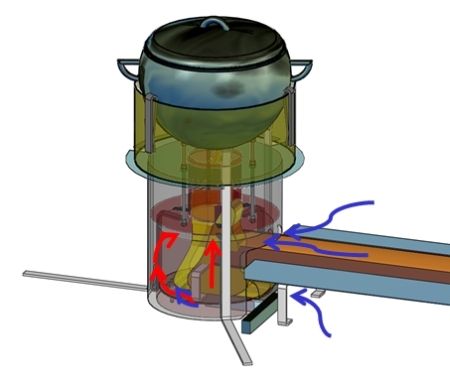 Richard Fetzner, a member of the association, contributed his many years of experience in the development and testing of energy-saving ovens. The adjustable efficiency plate “cake ring” is infinitely variable up to ø36cm. The brackets determine the correct distance to the pot. Efficiency plate and the pot can not slip off. Combustion chamber and furnace jacket are separated, thus the outside temperature on the jacket is limited to 260 ° C.